Along the path of Gran Cratere, along the Red lizard to discover the ancient tradition of the island of Ischia. 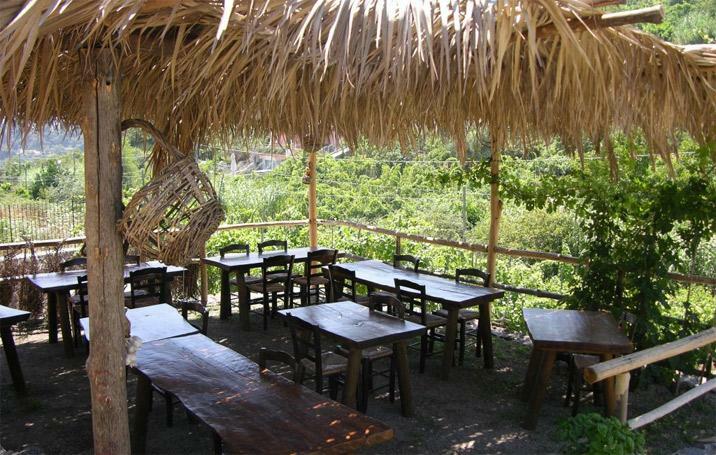 The trattoria la cantina del sargente from an old country cellar, maintains the traditional hospitality of the island, the brithers Beniamino and Luigi Mennella are waiting for you in a rustic atmosphere where every detail remembers the island peasant tradition. The cuisine by Angela and Antonietta with cure and originality is based on typical dishes of the island cuisine, using land products, farmed with love by daddy Gerardo Mennella. You can taste the country antipasto, pasta with bean, ham and pork underbell, island rabbit served in the characteristic terracotta vase, good also grilled. To the dessert keens, fruit jam tart, caprese and panettone. To reach the trattoria, if you have car, 100 m before the Pineta, turn left, at 300 m you find the Cantina. Park along the street and through the path you arrive in. To who arrived by bus, the line 6 arrives in Fiaiano, get off the first bus stop and at the traffic island take the street to the Trattoria, at 400 m and 5 minutes on foot.